The Advent season is under way. If asked the purpose of Advent, my standard unthinking answer would be that Advent is the time that the Church prepares to celebrate the Nativity of Our Lord. This would be a completely insufficient answer. The Church reads today a catechetical instruction by Saint Syril of Jerusalem on the twofold coming of Christ. It is clear that the Church wants us to start off Advent with the proper perspective. St. Cyril of Jerusalem is a Doctor of the Church who died in 386. This means he was alive during the years after the Council of Nicea and all the controversy and strife associated with the Arian Heresy that denied the divinity of Christ. As early is this, the Church had a well formed liturgical calendar and observed Advent! This is an ancient tradition indeed! St. Cyril offers us parallel pairs of events as the proper understanding of Advent. Christ came once as a babe, He will come again in glory. The first coming was marked by patience; the second will bring the crowning of the divine kingdom. In the first coming He was wrapped in swaddling clothes; in the second He will be clothed in light. In the first coming He accepted the cross; in the second He will come escorted by an army of angels. The Savior will not be judged again; He will judge those who judged Him. His first coming was to fulfill the plan of love; in the second, all men will be subject to His kingdom. St. Cryil quotes the words of the Nicean Creed: "He ascended into heaven, and is seated at the right hand of the Father, and he will come again in glory to judge the living and the dead, and his kingdom will have no end." St. Cyril gives us the doctrine as we hold it even now. "Our Lord Jesus Christ will therefore come from heaven. He will come at the end of the world, in glory, at the last day. For there will be an end to this world, and the created world will be made new." St. Cyril, Pray for us! This post begins commentary on a book concerned with the spiritual life. Spiritual Combat Revisited by Jonathan Robinson of the Oratory is an analysis of the The Spiritual Combat by Lorenzo Scupoli. Scupoli lived in the Sixteen Century. Robinson describes the Spiritual Combat as "a short, uncompromising statement of the theory and practice of the ascetical life, and Scupoli's pithy, laconic style leaves no room for ambiguity. It is a book that was the fruit of the author's own great personal anguish and still retains a quiet but unmistakable authority." We begin by defining the term "asceticism" and its role in the Christian life. Asceticism, or spiritual combat, is the name for the efforts that we make to cooperate with grace to become holy. Holiness is the struggle to overcome the division in our nature. We want what is holy and good and at the same time we are attracted to sin. In spiritual combat we fight our personal sin and strive to grow in the virtues. Spiritual combat is an essential aspect of the Christian life. We are divided within ourselves. On the one hand, we seek our desires one way, as Newman says, and our "knowledge and and conscience another." We are people who live life on earth but have our eyes on Heaven. Cardinal Newman describes this as a "dreadful state." How then do we live our lives with the hope of becoming holy. How do we become saints? It has always been the practice and tradition of the Church to ask individuals to make their lives consistent with the demands of perfection in the Gospel. We are in a "struggle with ourselves" because were are divided creatures. The division is referred to ask concupiscence in the terminology of theology. We all have the sense of this conflict within ourselves. We want and choose things that we know are contrary to the Faith. The struggle, in a form of combat" to "overcome these deep divisions in our nature and to bring our lives into harmony with the demands of the faith." This combat and struggle is asceticism. The books is about the theory and practice of asceticism or spiritual combat. It is critical to understand that asceticism is not only a medieval or early Church practice. Christianity requires effort to "fight personal sin and to develop virtues such as kindness, patience, truth-telling, and chastity. A warning is given that spiritual combat is not an end to itself but is a means for working for the perfection that is commanded by Our Lord. Spiritual combat is a necessity in the Christian life. This is an example of what happens when one has a shallow view of Judaism, Christianity, and the Holy Scriptures. This is the point of view of an American who does not understand that Jesus Christ founded a Church and put Saint Peter and his successors in the leadership of that Church. Our President-Elect is correct on the division within our country: we are divided by religion and irreligion. No, we are not a country with a state religion. And yet, we are individuals with religious convictions who must live in a secular state. Many choose irreligion in public and 'faith' in private. One more thought: the divisions within Christianity are at the root of Obama's comments in that it is these divisions that have made it impossible for Christianity to guide a nation state. Who's Christianity, indeed. Peter Kreeft is one of my favorite authors. I own just about every book that Professor Kreeft has published. Every word that flows from his pen is understandable. What is more, when I have read Kreeft, I understand the logic and structure of his points. Professor Kreeft uses lists liberally which makes it very easy to understand difficult concepts quickly and easily. Today I am beginning a series of reflections on Peter Kreeft's book Prayer for Beginners. I intend to follow the method of Mortimer Adler in that I will write a paragraph that summarizes each chapter. Following the summary, I will outline the key points. I will establish a new "Project." In the project, I will prepare an analytical table of contents for the book and include links to each post addressing the individual chapters. There is a danger when commenting on books that are as well written as this one. There is a danger that a reader may conclude that my analysis is sufficient and that the book need not be read. I assure you that there is no substitute for the intellectual and spiritual pleasure that can be found in reading and re-reading this book. With that, let us begin with Chapter One on the necessity of prayer. Prayer is essential to the spiritual life of the person. A human being is made of body and soul. Just as food nourishes and feeds the body, prayer nourishes and feeds the soul. How is the soul fed in prayer? Prayer feeds the soul because prayer puts the person in the presence of the Living God who alone is the source of the life of the soul. The life of the soul is directly related to the process of purification and sanctification. This is to say that one vital way in which we become holy is through prayer. It is not enough to study prayer, or the faith for that matter. It is only useful to study prayer if one practices prayer. I have never missed a meal. Yet, I miss prayer time on a regular basis. This chapter drives home that point that prayer should be as critical and urgent in every day life as is eating. It is a battle to make oneself pray. The Catechism calls this aversion to the hard work of prayer a battle. Why to we struggle to pray when we do not struggle to eat. I think that the problem may lie in our fallen natures. We are weak spiritually when we should be strong. The imperative of this chapter is that we must pray if we expect to live. Our eternal lives depend upon our faith and our love for others. Both of these components of the spiritual life are strengthened and made alive by our prayer life. What a pity it would be to be like the theologian that Peter Kreeft describes. What a shame it would be to be someone who studies what he does not do. "Eating keeps your body alive, and prayer keeps your soul alive. Praying is more important than eating because your soul is more important than your body." "You will get a new body after death, in the resurrection at the end of the world. But you will not get a new soul; you will only purify and sanctify your old one." "If you do not pray, your soul will wither and die, just as, if you do not eat, your body will wither and die." "Do not be like the the theologian who after death was given the choice between going to Heaven and going to a lecture on Heaven and chose the lecture." With this post I begin a new project: The Benedict XVI Project. Our Holy Father writes and says incredible things. Every time he teaches, I am astounded. This past Sunday was the Feast of Christ the King. The last Sunday of the Liturgical year concentrates on Jesus as King. As the Holy Father teaches, the reality is that Christ will judge the world and everyone in it. It is wise to pay very close attention to our Pastor's words. On Sunday 23 November, Feast of Christ the King, "the Word of God will also remind us that the face of Christ, universal King, is that of a judge, because God is at one and the same time the good and merciful Shepherd and the righteous Judge", said Pope Benedict. "The criterion with which judgment is applied", he went on, "is of great importance. This criterion is love, real charity towards others, especially the 'little ones', people in greater need. ... Christ identifies Himself with the 'smallest of His brothers and sisters', and the final judgment will be a settling of accounts of what happened in earthly life". God "is not concerned with historical kingship, He wishes to reign in people's hearts and from there over the world. He is the King of the entire universe, yet ... the area in which His reign is at risk is in our own hearts because there God encounters our freedom. We, and we alone, can ... hinder His kingship over the world, over families, over society and over history". "Jesus wishes to associate us with His royalty. That is why He invites us to collaborate in the advent of His Kingdom of love, justice and peace. It is up to us to respond to Him, not with words but with deeds. By choosing the path of effective and generous love towards others, we allow Him to extend His lordship over time and space". The Benedict XVI Project page can be found here. The quote above came from the Vatican Information Service daily email. If any comments arrive requesting the link to VIS, I will publish it. The purpose of all morality is to direct us to Our Lord Jesus Christ. Our way of living, our actions and our choices reflect the degree to which we chose or reject the love of God. The moral law is fully realized in the person of Jesus the Lord. He is the perfect man. In his human nature He was perfect just as He is perfect in His divinity. The purpose of the law, Scripture tells us, is the justification - and salvation - of each person. Q. In whom does the moral law find is fullness and unity? Q. What is meant by the phrase "fullness and unity?" A. "Fullness and unity" means completeness and comprehensiveness in a single entity. Q. Who is the way of perfection? A. The way of perfection is the person of Jesus Christ. Only in God is perfection found. Q. What does it mean to be the 'end of the law?" A. The end of a thing is the purpose for which it exists. Therefore, the law exists for the purpose of pointing to Jesus Christ. A. Only Jesus Christ teaches. All other true teachers can only teach what they have heard from Him. Q. What does it mean to say that Jesus bestows the justice of God? A. On that Last Day, it has been given to Jesus Christ, the perfect man, the One who is fully human and fully divine, to judge and implement the justice of God. Q. Who is justified according to Romans 10:4? A. Chris is the "end of the law" so that everyone who has faith may be justified. Justification is to be restored to friendship with God. This is an amazing video. The message is clear. It is very difficult for parents to see and hold their new born infants and see them as anything other than perfect. And yet, revelation and experience tell us that every person is born fallen and tainted by original sin. The Catechism summarizes our condition at birth in Paragraph 1250. If we can see with spiritual eyes, we will see that infant baptism is an incredible act of mercy and graciousness by Our Lord. He commanded that the children be allowed to come to Him. We should heed his command. 1250 Born with a fallen human nature and tainted by original sin, children also have need of the new birth in Baptism to be freed from the power of darkness and brought into the realm of the freedom of the children of God, to which all men are called. The sheer gratuitousness of the grace of salvation is particularly manifest in infant Baptism. The church and the parents would deny a child the priceless grace of becoming a child of God were they not to confer Baptism shortly after birth. Q. Why do we need to baptize infants? A. Infants need Baptism because they are born with a fallen human nature and are tainted by original sin. Q. What is the effect of infant Baptism? A. The effect of infant Baptism is new birth and freedom from darkness. Additionally, the child is brought into the realm of the freedom of the Children of God. The infant becomes a regenerated son or daughter of God. Q. How is the Baptism of older children or adults different than infant Baptism? A. In infant Baptism no actual sins are forgiven because an infant is not able to commit a sin. Baptism of older children and adults wipes away all actual sin. Nonetheless, an innocent child is born separated from God; Baptism makes the infant a child of God. Q. Why does God allow infant Baptism? A. God pours out His infinite mercy and freely gives grace that is available by the merits of Our Lord Jesus Christ. Q. Does the Church teach that Baptism is an urgent matter? A. Yes, Baptism is an urgent matter. The Catechism goes so far as to say that denying Baptism is to deny a child the "priceless grace of becoming a child of God." "At the lodging place on the way the Lord met him and sought to kill him. Then Zipporah took a flint and cut off her son's foreskin, and touched Moses' feet with it, and said, 'Surely you are a bridegroom of blood to me! So he let him alone. Then it was that she said, 'You are a bridegroom of blood,' because of the circumcision." Why did the Lord want to kill "him?" Is the Lord to kill Moses or his son? Why did Zipporah touch Moses feet? What does it mean to be a "bridegroom of blood?" What is this episode all about? This is a very mysterious segment of Holy Scripture! Ephrem the Syrian notices that this son that was not circumcised demonstrating that Moses must have discontinued or not instituted the practice of circumcision while in Midian. Such a decision would be a grave violation of the directive given to Abraham applicabale to all Hebrews. Zipporah acted quickly by circumcising her son. She must have understood that the failure to circumcise her child had angered the Lord. It seems that she might have acted in the same manner if either Moses or her son were the object of the threat. The Navarre Bible supposes that Moses is the object of the threat interpreting that the meaning of the text is to say that Moses became gravely ill. It is in this way that the Lord "sought to kill" Moses. Correspondingly, Zipporah interprets that situation and acts accordingly. The reference to Moses feet is a euphemistic way of saying that Zipporah circumcised Moses! It is suggested that the reference to a "bridegroom of blood" is related to a Midianite marriage rite. The reason for the inclusion of this episode is primarily to demonstrate that Moses himself was circumcised. Recall that Moses had been hastily rescued by Egyptians and he apparently was not circumcised. This episode accounts for Moses inclusion in the covenant established by God in Genesis 17:14. We can say the following: The Lord was angry that Moses had not been circumcised personally nor had Moses ensured that his son was circumcised. Zipporah did not put the child's blood on Moses. Scripture says that she "touched Moses' feet with it." This means that she touched Moses with the flint to circumcise him. The reference to Moses feet is a euphemistic reference to his foreskin. The Midianites had a marriage ritual that involved circumcision. This episode takes place to demonstrate that Moses was circumcised and thus fully one with the Hebrew people. Zipporah is the heroin in the incident. There it is! Mystery solved. On Fridays the Church requires her sons and daughters to think of their sinfulness and do some act of penance. We also focus on Our Lord's suffering and death on the Cross. Penance is an idea that the world no longer comprehends. While no work on our part can ever compensate God for our unrighteousness, the saints can offer the merits of Christ along with their penances. The merciful Father receives the tiny actions of His children and is pleased by them. However, God forces no one to enter into his household. St. John Chrysostom explains why some do not receive salvation. "And if by grace, it will be said, how came we all not to be saved? Because you would not. For grace, though it be grace, saves the willing, not those who will not have it, and turn away from it, who persist in fighting against it, and opposing themselves to it." All law flows from the Eternal Law. The Lex Aeterna establishes the Laws of Science - the observed behavior of material objects - and, more importantly for us, the Principles of Morality. 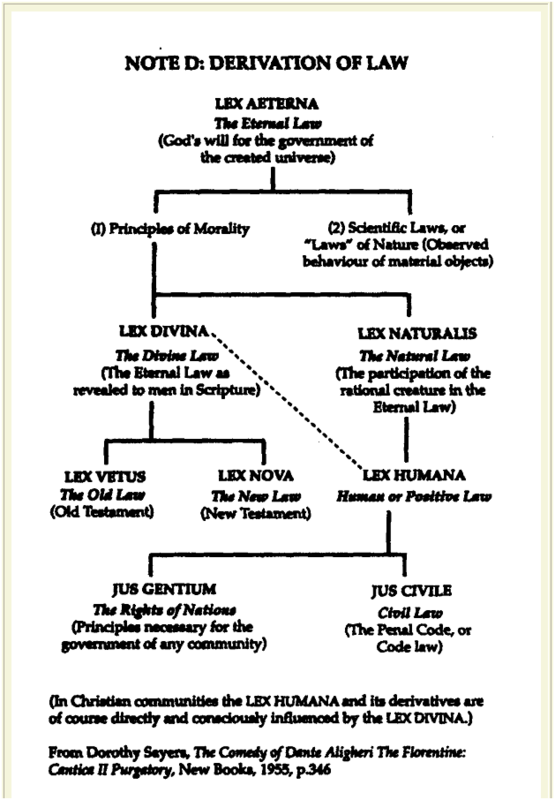 The key principles of morality is the Divine Law, or the Lex Divina, and the Natural Law out of which flows the Lex Humana or what is now known as Positive Law. The system of laws is beautiful in its structure. 1952 There are different expressions of the moral law, all of them interrelated: eternal law - the source, in God, of all law; natural law; revealed law, comprising the Old Law and the New Law, or Law of the Gospel; finally, civil and ecclesiastical laws. Q. What are the different expressions of the moral law? A. The first expression of the moral law is Eternal Law. Eternal Law is in the nature of God and is the source of all law. The second expression of moral law is Natural Law. Following Natural Law is Revealed Law. Q. What are the components of the Revealed Law? A. Revealed Law is composed of the Old Law and then the New Law. The New Law is also known as the Law of the Gospel. Q. What law flows from the Natural Law? A. Natural Law is flows into civil and ecclesial laws. Additionally, the Rights of Nations are a facet of civil law. Q. How is Eternal Law defined? A. Eternal Law is God's will for the government of the created universe. Q. How is Divine Law defined? A. Divine Law is the Eternal Law as revealed to men in Scripture. Archbishop Chaput of Denver is great. I am very proud of him and pray for him frequently. Consider his words here. If there is a commercial at the end of this, that is the price of free content.